Scientists have answered a burning question central to the charm of sunflowers: Why do young flowers move their blooms to always face the sun over the course of a day? And then: Once sunflowers reach maturity, why do they stop tracking the sun and only face east? Researchers found that the plant’s turning is actually a result of different sides of the stem elongating at different times of day. In a newly-published article in Science, the researchers say the young plant's sun-tracking (also called heliotropism) can be explained by circadian rhythms – the behavioral changes tied to an internal clock that humans also have, which follow a roughly 24 hour cycle. A young flower faces east at dawn and greets the sun, then slowly turns west as the sun moves across the sky. During the night, it slowly turns back east to begin the cycle again. "It's the first example of a plant's clock modulating growth in a natural environment, and having real repercussions for the plant," UC Davis professor and study co-author Stacey Harmer says in a press release from the university. "The higher growth rate on the east versus west side of the stem during the day enables the shoot apex to move gradually from east to west. At night, the higher growth rate on the west side culminates in the apex facing east at dawn." The researchers tied plants up so they couldn't move or turned them away from the sun – and they found those flowers eventually had "decreased biomass and less leave area" than flowers that could move with the sun. And in support of the circadian rhythm theory, plants exposed to artificial light at different intervals "could reliably track the movement and return at night when the artificial day was close to a 24-hour cycle, but not when it was closer to 30 hours," the press release states. 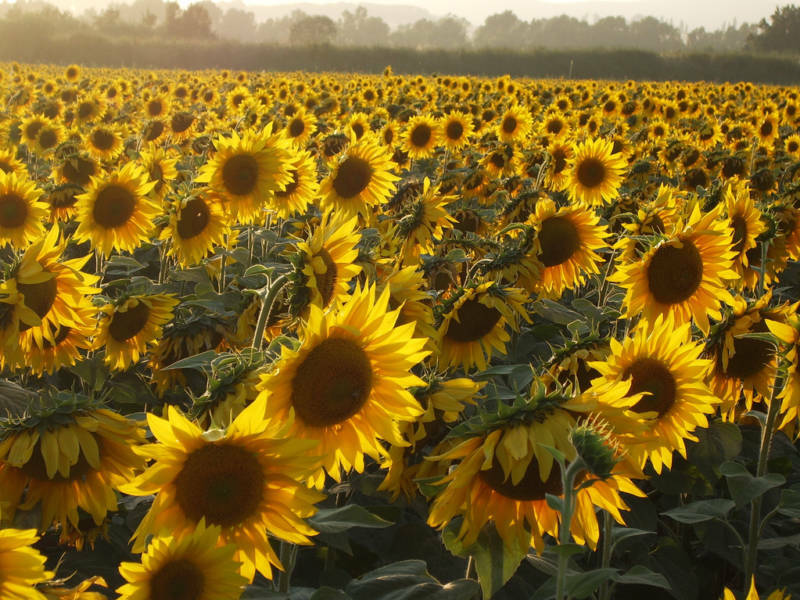 Mature sunflowers respond differently to the sun. According to the press release, "as overall growth slows down, the circadian clock ensures that the plant reacts more strongly to light early in the morning than in the afternoon or evening, so it gradually stops moving westward during the day." The researchers compared mature flowers facing east with those they turned to face west, and found that the east-facing blooms attracted five times as many helpful pollinators. That's because the east-facing flowers heat up faster. And, "bees like warm flowers," as Harmer puts it. "Just like people, plants rely on the daily rhythms of day and night to function," Anne Sylvester, director of the National Science Foundation's Plant Genome Research Program, says in a press release. "Sunflowers, like solar panel arrays, follow the sun from east to west. These researchers tap into information in the sunflower genome to understand how and why sunflowers track the sun." UC Berkeley professor and study co-author Benjamin Blackman says he thinks the connection between circadian rhythms and growth could be applicable to other research. "The more general point, that one of the circadian clock's adaptive functions is to regulate the timing and strength of growth responses to environmental signals, is one that I think will apply to a broad range of traits and species," he said.